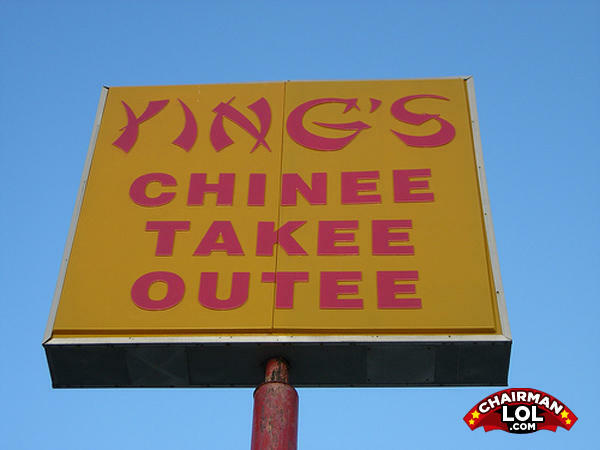 Whaa, you no speaka Chinee? Sounds like some kind of sexual pose involving a chin and perhaps a navel. I'm afraid this was done on purpose. There were a bunch of Takee Outee's in New Orleans at one time. What's the difference between a jazz musician and a cheese pizza? A cheese pizza is a food and a jazz musician is a person. Guy: Did it hurt when you fell from heaven? Girl: No, but it will hurt when I pepper spray you.